Experience some of the finest skiing on earth at Sunshine Village, Mount Norquay, and Lake Louise ski areas. Skiing in the Canadian Rockies offers the opportunity of a liftetime to ski the lightest and airiest powder revered by skiers and boarders worldwide. The Canadian Rocky Mountains are one of the few places on earth blessed with the conditions that create extremely light and airy powder. And Alberta has one of the longest ski seasons on the planet. Most of the mountain park resorts are open the first week of November through late April, even into May. From Buffalo Mountain Lodge in Banff, it’s a 15-minute drive to Mt. Norquay and a 30-minute drive to Sunshine Village. Deer Lodge in Lake Louise is only a 15-minute drive from Lake Louise Ski Resort. Buffalo Mountain Lodge offers a complimentary shuttle to the Banff Ski Bus. Please inquire with the front desk. The shuttle is subject to availability. Deer Lodge offers a complimentary daily shuttle service to and from the Lake Louise Ski Hill. Nestled in the majestic Canadian Rockies in the heart of Canada’s oldest and most famous national park, Sunshine Village Ski and Snowboard Resort provides a breathtaking car-free environment with picture perfect views. Three sprawling mountains provide unparalleled site lines, uninterrupted by any signs of civilization beyond the world-class resort’s boundary. The resort features more than 3,300 acres of skiable terrain, with 12 lifts and 111 named runs. Family-friendly Mt. Norquay offers outstanding conditions for beginner, intermediate and advanced skiers and riders. Since its opening in 1926, Mt. Norquay continues to be the locals’ gem. Famous for being the training ground of Olympic and World Cup athletes, and with excellent beginner terrain, everyone will love this small, family-friendly resort. Just minutes from the Town of Banff, Mt. Norquay offers the only night skiing in Banff-Lake Louise, including a fully lit terrain park, and expert snow making on 85% of the terrain. Known as the “Champagne Powder Capital of Canada TM”, Kicking Horse is located 2.5 hours west of Calgary in beautiful Golden British Columbia. Our diverse terrain caters to all ability levels, with everything from steep alpine chutes to wide open cruising green runs making us a family favorite destination! Save 25% off your room rate, when you ski and stay! Spend your days hitting the slopes at Mt. 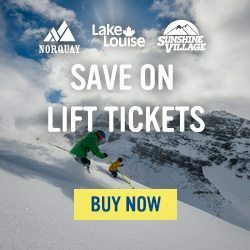 Norquay, Lake Louise, or Sunshine Village before retiring back to Buffalo Mountain Lodge in Banff or Deer Lodge in Lake Louise to take a dip in the hot tub or indulge in Apres ski. Lake Louise’s Ski Friends are a particularly friendly bunch. These snow-loving volunteers will show you where to find the hill’s best run and best snow – for free. No pre-booking required; guided tour daily during ski season at 9:30 a.m., 10:15 a.m. and 1:15 p.m.
For More Information or contact 403.522.3555. All of the above ski hills offer rentals. Below are additional rental locations.